Well, the official "learning to play left-handed golf" part of the project came to an end last weekend, with the 2011 "White Lake Classic." This venerable event began 25 years ago when a group of friends were invited to a family cottage on White Lake in Michigan to perform manual labor in exchange for free lodging and golf. It has since evolved into the golf season's true "fifth major," with bragging rights and a true monstrosity of a traveling trophy on the line for the winner. This year, it was also the designated "finish line" for the Scratch in the Mirror book project, the official end of the one-year commitment. 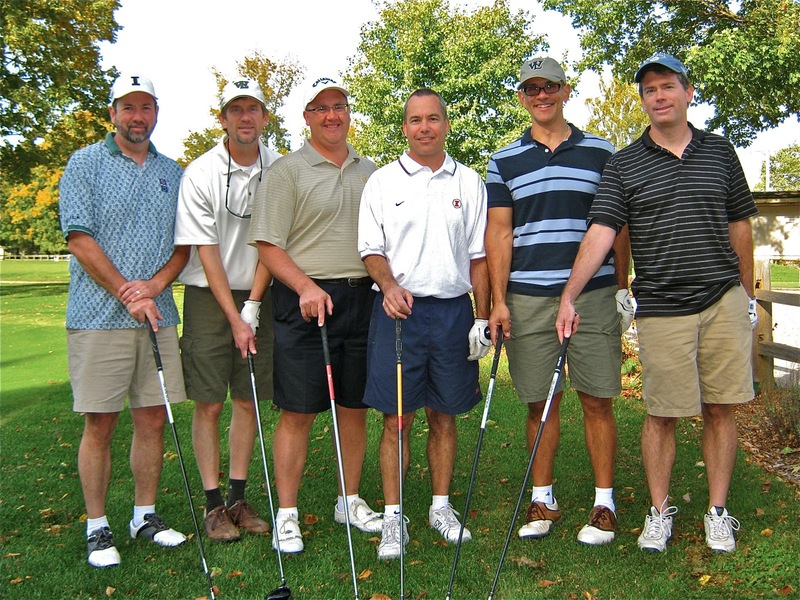 Pictured here are the six surviving participants on the first tee at the White Lake Golf Club (a.k.a. "The Burial Place of Old Man Gloom"): Mike "Zim" Zimmerman, Rob "The Glacier" Twardock, Mike "Scruffy" Neuses, Tom "Scagg-bagger" Scaggs, Tom "Serbo" Lessaris, and Keith "Keith" Staggs. I, too, am a left handed player but I think that's what makes me aim my golf ball to land on the hole way better than others. I wish I had seen those six left-handed players' game too so that I could get some tricks as well.